This contest started on 1/27/19. This contest has a winner. * Win A $20 Krystal Gift Card. Real simple story, Jeff Eats got a $20 Krystal Gift Card to give to one of you guys! The Krystal Gift Card is good at any Krystal location (Krystal.com for locations, menu, info). ***** Krystal, 901 W. Sample Road, Fort Lauderdale, Florida 33311 (954) 524-9994. Let me make this write-up short and sweet. There are no White Castles in South Florida. Krystal is as close to being a White Castle as you will find in South Florida. 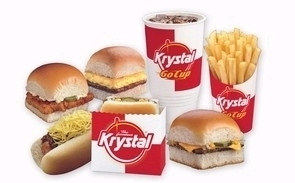 Krystal is a “national” fast-food hamburger chain which has been around since 1932. White Castle has paper-thin- square shaped-burgers called ” SLYDERS” and Krystal has paper-thin- square shaped burgers called “KRYSTALS.” I like “slyders” better than “krystals”…but it’s a close call. Sort of like Coke and Pepsi. Like I said before, there is one Krystal joint in South Florida– Fort Lauderdale…there is a whole bunch of them in Orlando. Check Krystal’s website www.krystal.com for menu/locations. The joint in Fort Lauderdale is open 7 days a week from 7am-midnight. I hope to be selected!